A couple of kindergarten-level drawings may help us finally get an unforgettable image of the church in your minds. 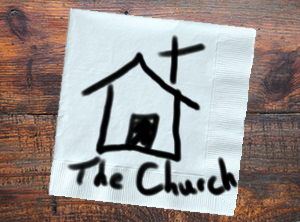 Take a moment to imagine yourself sketching a picture of the church on a restaurant napkin. What did you picture? I’ll be it was a square or rectangle with a pointed roof line, topped by a cross. Right? It would be so much better to draw a bunch of stick-figure people doing life and mission together. I’m not down on buildings; I’m up on the people of God. I want to make them the center of our image of the church. Working against the image of the church as a sent people are three common misconceptions. The vast majority of Americans would define the church in one of three ways: church as a place, an event or a famous pastor. Hope to change these wrong ideas without casting local churches aside as irrelevant relics, I offer a definition of church that puts it in its proper, penultimate place: The church is created and governed by the calling and sending activity of God. The church is secondary to the kingdom of God in that it is the instrument or means through which God regularly expresses himself. As long as local churches see themselves in this light and conduct their activities for the purpose of equipping and releasing God’s people to follow Jesus and serve others during the 167 hours of a week they are not in church, they are doing fine and need not be criticized. They have a legitimate, God-given role to play. These “team meetings” can be design to help people perform better as followers and servants in the real game being played outside of the church building. https://myholytrinitychurch.com/wp-content/uploads/2016/12/church.jpg 222 300 Todd Hunter https://myholytrinitychurch.com/wp-content/uploads/2013/04/Page-Header-Logo.png Todd Hunter2016-12-30 18:30:402016-12-30 18:32:41What Is Church?